Ampio designed what it thought would be a final pivotal clinical trial of Ampion (AP-003-C), predominately under guidance from FDA CBER’s Office of Blood Research and Review (OBRR). However, a reorganization of CBER occurred, and the regulatory guidance for AP-003-C was transferred to the Office of Tissue and Advanced Therapies (OTAT). As previously disclosed in August 2018, OTAT expressed concerns over the trial design and advised the Company to execute an additional clinical trial designed under a Special Protocol Assessment (SPA). Ampio is moving ahead with a new clinical trial design under a SPA but disagreed with the OTAT’s decision regarding the insufficiency of AP-003-C and formally requested FDA to reconsider. The FDA has now accepted a Type C meeting proposal from Ampio that could lead to the resolution of our dispute regarding the acceptability of AP-003-C as the 2nd of the two required Pivotal trials for the filing of a BLA and scheduled the meeting before the end of November 2018. Ampio will promptly report any further news after it is received. 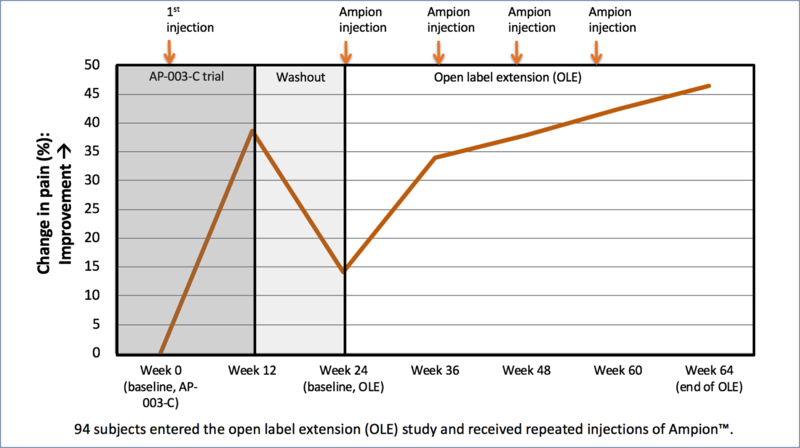 The primary objective of the Open-Label Extension (OLE) study, which followed the completion of the AP-003-C study, was to investigate the safety and tolerability of patients with severe osteoarthritis of the knee (KL4) receiving up to 5 injections of Ampion administered every 12 weeks, but efficacy was tracked and reported. 94 subjects entered the OLE study; 8 (9%) subjects discontinued. Subjects received an average of 4 injections with a total exposure of 48 weeks. The longest exposure was 59 weeks. Three of the 41 AEs were possibly related to the procedure (not Ampion), and all the remaining 38 AEs were unrelated. Two patients experienced post-injection knee pain. Improvements in pain: 39%, 34%, 38%, 42%, and 47%, respectively for 1, 2, 3, 4, and up to 5 injections of Ampion. Functional improvements: 38%, 32%, 35%, 44%, and 47% respectively for 1, 2, 3, 4, and up to 5 injections of Ampion. Responder status: 70%, 68%, 71%, 75%, and 75% respectively for 1, 2, 3, 4, and up to 5 injections of Ampion. Mike Macaluso further noted, “Severe OAK Patients (KL-4) whose therapeutic options are limited (strong opioids or total knee replacement) reported a consistent/persistent, beneficial effect from each repeat injection of Ampion. The OLE study of the AP-003-C pivotal trial shows that each subsequent injection of Ampion provided a sustained, significant reduction in pain, improvement in function and 70% responder rates from patients with severe OA disease. Regulatory Exclusivity and IP protection: Ampio believes that Ampion™, a low molecular weight fraction of human serum albumin with anti-inflammatory properties, will be identified as a “reference product” upon FDA approval of their BLA. Reference products are granted twelve years of exclusivity under the PHS Act, 42 U.S.C. § 262(k)(7). Specifically, FDA is not permitted to approve an application for a biosimilar or interchangeable product until 12 years after the date of the first licensure of the reference product. The existing Ampion™ portfolio has patent coverage in all major jurisdictions throughout the world (U.S., Europe, Australia, Brazil, Canada, China, Eurasia, Hong Kong, India, Indonesia, Israel, Japan, Korea, Mexico, Malaysia, New Zealand, Philippines, Singapore, South Africa) for pharmaceutical compositions and methods of treating a range of conditions. The portfolio includes 125 issued patents and 85 pending applications throughout seven primary patent families having expiration dates that extend to 2035. About Osteoarthritis: Osteoarthritis (OA) is an incurable and progressive disorder of the joints involving degradation of the intra-articular cartilage, joint lining, ligaments, and bone. The incidence of developing osteoarthritis of the knee over a lifetime is approximately 45%. As this disease is associated with age, obesity, and diabetes, this number will continue to grow. Certain risk factors in conjunction with natural wear and tear lead to the breakdown of cartilage. Osteoarthritis is caused by inflammation of the soft tissue and bony structures of the joint, which worsens over time and leads to progressive thinning of articular cartilage. Other symptoms include narrowing of the joint space, synovial membrane thickening, osteophyte formation and increased density of subchondral bone. About Ampio Pharmaceuticals: Ampio Pharmaceuticals, Inc. is a development stage biopharmaceutical company primarily focused on the development of therapies to treat prevalent inflammatory conditions for which there are limited treatment options. We are developing compounds that decrease inflammation by (i) inhibiting specific pro-inflammatory compounds by affecting specific pathways at the protein expression and at the transcription level; (ii) activating specific phosphatase or depletion of the available phosphate needed for the inflammation process; and (iii) decreasing vascular permeability. Ampio’s statements in this press release that are not historical fact, and that relate to future plans or events, are forward-looking statements within the meaning of the Private Securities Litigation Reform Act of 1995. Forward-looking statements can be identified by the use of words such as “believe,” “expect,” “plan,” “anticipate,” and similar expressions. These forward-looking statements include statements regarding Ampio’s expectations with respect to Ampion™ and its classification, as well as those associated with regulatory approvals and other FDA decisions, the Biological License Application (BLA), the ability of Ampio to enter into partnering arrangements, clinical trials and decisions and changes in business conditions and similar events, all of which are inherently subject to various risks and uncertainties. The risks and uncertainties involved include those detailed from time to time in Ampio’s filings with the Securities and Exchange Commission, including without limitation, under Ampio’s Annual Report on Form 10-K and other documents filed with the Securities and Exchange Commission. Ampio undertakes no obligation to revise or update these forward-looking statements, whether as a result of new information, future events or otherwise.